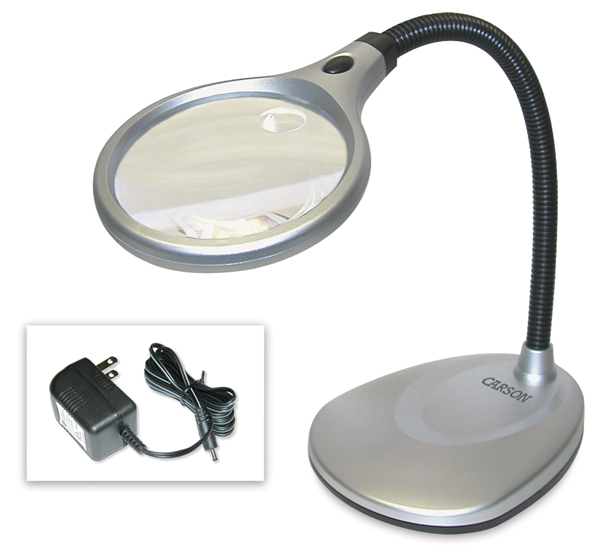 The Carson DeskBrite 200 LED Magnifier is a 2X magnifier desk lamp with a 5X power spot lens. It features two super-bright LED lights, while its large 4"Dia (10 cm), crystal-clear acrylic lens provides a large viewing area for any task. The flexible neck allows you to position the lens exactly the way you need it. Overall it measures 7" × 5¾" × 20½" (18 cm × 15 cm × 52 cm). It runs on AC power with the included adapter, or it can be powered with three AA batteries (not included).